This adapter is a generic TSSOP28/34 to DIP adapter. 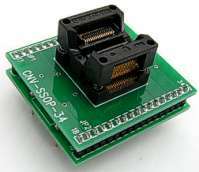 It can be be used on any programmer for all TSSOP28 to TSSOP34 conversion. It is 1:1 pin mapping from TSSOP to DIP. Example chips accepted on the adapter: PIC16F872 TSSOP28 package.